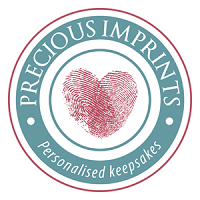 Welcome to Precious Imprints Personalised Jewellery & Keepsakes. Do you feel like your children are growing up way too fast? Do you want to be able to keep them close always? With a piece of personalised jewellery from Precious Imprints, you can do just that. Hi, I’m Jo. A mum to 3 busy children, a wife, a daughter, a sister, a friend, a physiotherapist and a creative being. For as long as I can remember I have enjoyed creating. Sketching, cross stitch, pottery, ceramics, mosaics, jewellery…you name it, I’ve probably done it and loved it! But there are only so many pieces one household can fit. In 2010, I stumbled across personalised jewellery and immediately fell in love with the concept. The joy I felt when I received my very own piece of personalised jewellery surprised me. But even better was the feeling that piece of jewellery gave me when I wore it. I felt comfort in having my children close to my heart and the little jingle from my pendants on my necklace were a constant reminder and connection to my babies. From this feeling Precious Imprints was born. connection to your family and the things you love. What better way to fill my creative need…..and not my house…..than creating personalised jewellery that allows you to celebrate life events, cherish those you love and keep them close always. Thank you for taking the time to visit my page. I hope you love what you see. Make sure you sign up to my VIP’s email list to keep up to date with all the latest news, products and sales. Or better still shop online now and begin creating your very own piece of comfort today! Visit the online store to create your piece of comfort today!